Were you looking for Employment Law - Florida or Florida Wrongful Termination lawsuits? Workers' Compensation is insurance coverage purchased by the employer/business that provides workers' benefits for job-related employee injuries. Florida law requires all employers to purchase Florida workers' compensation coverage (with a few exceptions). 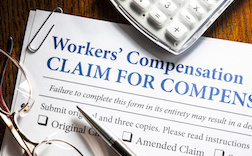 Some workers may have unreasonably been denied their Florida workers' compensation benefits or may find they have long waits for their benefits to kick in. In such cases, workers’ compensation lawsuits can be filed to ensure the employee's rights are protected. Send your Florida Workers Comp claim to a lawyer who will review your claim at NO COST or obligation. In Florida, the Division of Workers' Compensation within the Department of Financial Services ensures that employees receive proper compensation, which includes benefits for medical expenses, disability, or death. The Office of Insurance Regulation primarily regulates the rates, forms and solvency for this type of coverage. Under Florida Workers’ Compensation, business owners are protected from being sued (unless special circumstances exist) if one of their employees is injured or becomes ill at the workplace. The insurance company may pay all medical bills and/or wage replacement when an employee gets hurt or sick on the job. The Florida Supreme Court has recently ruled that the employee will no longer be on the hook for legal fees. Previously, it was difficult to find legal representation, unless you were able to pay attorney fees to obtain benefits. Although Florida is known as a business-friendly state, it isn’t necessarily an employee-friendly state. There are many restrictive laws in Florida that make it difficult for an injured worker to receive benefits due under their workers’ compensation policy. For instance, you may not see your own doctor: a workers’ compensation physician will be assigned to diagnose your injury or illness. And these doctors are typically mandated to get you back to work as soon as possible. It is important to have an experienced Florida workers’ comp attorney advising and protecting you against unfair or questionable practices. Further, if the insurance company proves that you can work at any job, even at a reduced salary, you may be forced to return to work and put your health at risk. Settling a Florida Workers’ Compensation claim typically means that you will receive a lump sum payment, which means your employer is not responsible for your medical expenses. It is up to the employee to decide whether to settle: Neither can a Workers Compensation judge nor an employer force you to settle for a lump sum. And you cannot force an employer to settle, nor can your employer force you to settle. The settlement amount is based on a number of factors, such as age, education, health, work experience and average wage. Depending upon the injury or illness, future medical needs are taken into consideration along with level of impairment. Because compensation is extinguished if you pass away, life expectancy is also considered. Florida workers’ compensation settlements usually require that you release all claims against your employer arising out of your work injury, including the right to any additional medical treatment, wage loss benefits, and occupational rehabilitation services. Florida Workers Compensation includes a procedure that allows an injured worker to file a Petition for Benefits ("PFB") if benefits are denied. The insurance company may decide to cover wage benefits and deny medical costs, or vice versa. A PFB, which is a formal complaint, can be filed to seek the benefit not covered. A judge will then schedule a mediation and attempt to resolve benefit disputes. At this time you can discuss a settlement of your claim. Among the claims that can be made in a workers' compensation complaint are that benefits have been unreasonably denied or delayed, that full entitled benefits have not been provided, that employees have been forced back to work against medical advice, or that employees are forced to speak with a doctor who is not impartial and orders the employee back to work. Employees who have their claims denied can file an appeal of the decision. However, the process can be complex and claimants may want to consider consulting with a workers' compensation attorney who is experienced at handling such claims. A landscaper was catastrophically injured in a motor vehicle accident. The insurance company agreed to fund a settlement for $2,200,000 that will provide a lifetime duration of medical and nursing care as well as handicap accessible transportation and permanent total disability wage benefits. In 2014 Workers compensation paid nearly $1 million in medical bills and wages following a complex elevator accident case. The lawsuit was settled just prior to trial. A worker rendered quadriplegic after 20-foot fall from ladder settled for $1,400.000 with the employer and workers' compensation carrier providing for future medical expenses and wage benefits. Client continues to work full time with accommodations provided by employer. The settlement has a projected lifetime payout of over $2,886,000. If you or a loved one has suffered a loss as a result of Denied Workers Compensation, please click the link below and your complaint will be sent to a lawyer who may evaluate your Florida Workers Compensation claim at no cost or obligation.